Wild, windy, and free! Lighten your load by making your <b>memorable</b> announcements via this North Dakota Club Flyer. 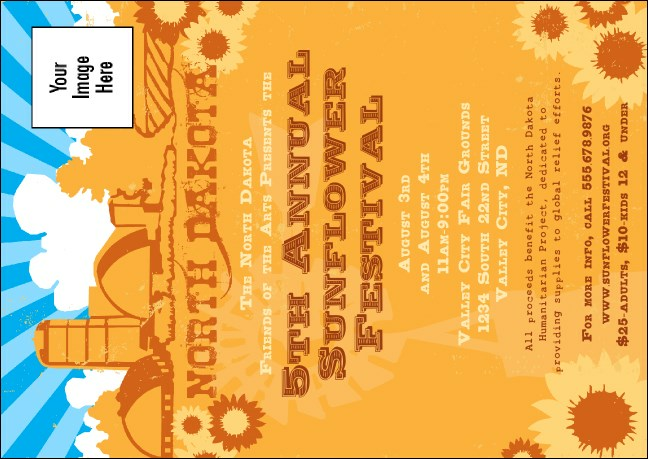 A <b>delightful</b> design featuring sunflowers bobbing in a colorful meadow is an ideal way to merge your mailing list and <b>generate interest</b> in your big, upcoming Flickertail State event. <ul> <li>North Dakota Club Flyer</li> <li>Approximately 6.1" x 4.35"</li> <li>Double sided printing</li> <li>Upload one custom image</li> <li>Heavy duty card stock</li> <li>Matching publicity material</li> </ul> Let your news fly like the wind with fast Club Flyers from TicketPrinting.com.